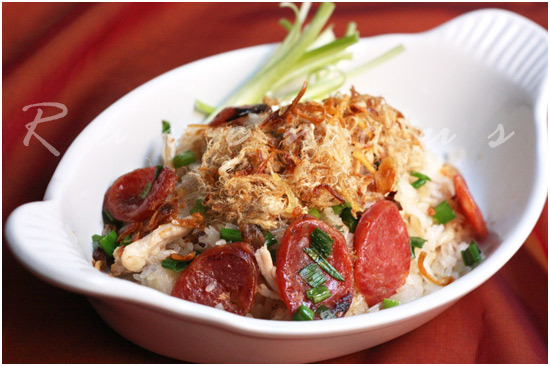 Xoi man – sticky rice with Chinese sausage, chicken, shrimp and shredded pork was a common dish my mom would make for weekend picnics at the park or as a side dishes to barbecues. 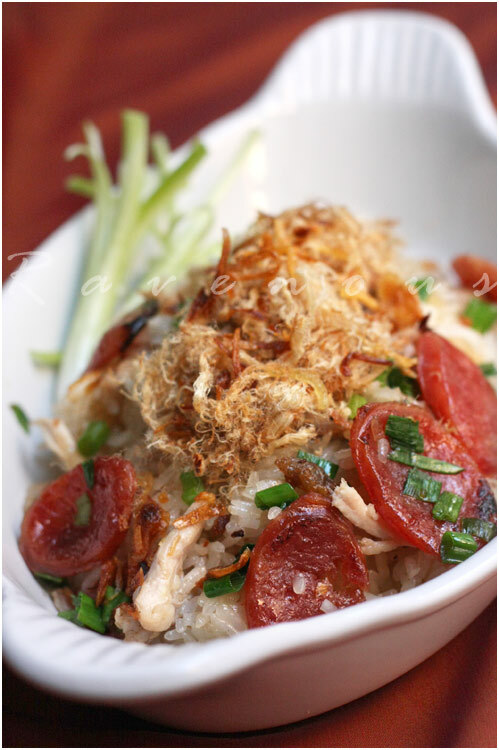 “Man” means salty in Vietnamese but in this context it’s more like savory to distinguishing it from the many sweet sticky rice recipes–as this is a hearty meal all in one composed of sticky rice, Chinese sausage (lac xuong), shredded chicken, and ruoc or cha bong (dried shredded pork/chicken), and dried shrimp. Ruoc can be found in your Asian grocery but if you can’t find it, it’s not a deal breaker. You can also substitute Vietnamese ham (cha lua) for the Chinese sausage as well. But if you can’t find some of these items–no big deal! You can add more or less and even use thin strips of pan fried egg similar to our bun thang recipe. As with the previous Sweet Pandan Coconut Sticky rice (xoi la dua), the glutinous rice needs to be soaked preferably over night. A quick sautee of the chinese sausage, chicken, shrimp, and voila..you’ve got xoi man. It’s that simple. Add the drained glutinous rice to a bowl and mix well with soy sauce. Using the bamboo steamer or a regular steamer lined with muslin, add the glutinous rice and steam about about 12-15 minutes (longer if you soaked it less than overnight) or until rice is soft, sticky and translucent but not mushy and still holds it’s shape. If you think it’s too dry, add a tbs of water and mix. In the meantime, in pan or work on medium high, add the Chinese sausage, onions, dried shrimp and chicken. No need for oil here as the fat from the Chinese sausage is more then enough. Add a dash or two of soy sauce if you like. Finally toss in the green onions when chicken is just about done and turn off heat. When the sticky rice is done, remove to a mixing bowl. Add the sauteed mixture and mix well. Adjust seasoning by adding additional soy sauce as desired. When serving, top with ruoc/cha bong and fried shallots. 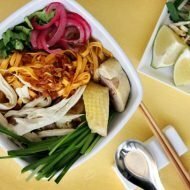 This was so good I ate it for lunch almost every day this week! Aside from the soaking time for the glutinous rice, this recipe can definitely be done in 25 minutes or less so give it a try! And don’t worry about finding all the ingredients–it’s a great recipe to clean out the fridge with! 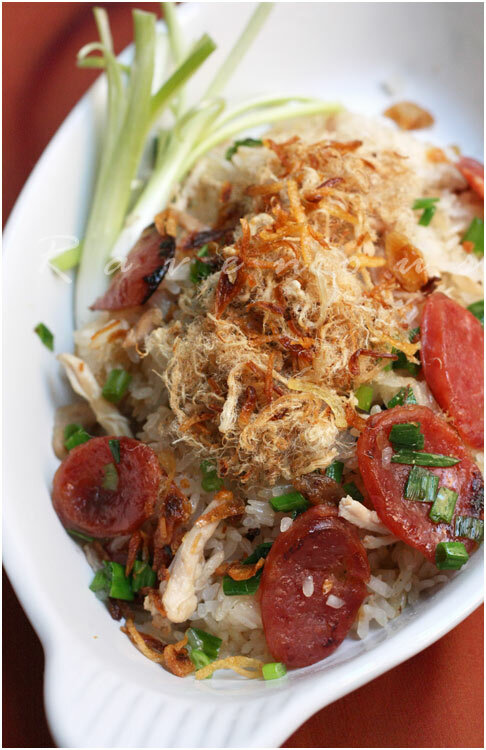 Ah, this is similar to our claypot rice Chinese sausage with rice is always a winner! Two thumbs up from me! As always, this looks amazing! Hi, first time dropping by here. Just want to let you know that you have a great blog. Just love all your recipes here. Surely is delicious. I used to make similar dish, but using clay pot to cook it. Yours look so yum! Thuy: Xoi man is also one of our favorites too! Little Teochow: You're right..it's really similar to what you made recently. Adding chicken and dried shrimps also makes it really flavorful. ICook4fun: Thanks for stopping by and commenting. Hope to hear from you often! Elra: We'll have to look into the clay pot method of yours..thanks for comments! this is one of my favourite dish!! Your post has tempted me so much that I will try your recipe as soon as I am back from my holiday. I love sticky rice and this one is similar to my mom's sticky rice, but still different. (My mom usually uses pork, not chicken.) We use it as "stuffing" for Thanksgiving. Ellie: Your vacation destination looks and sounds wonderful! We hope you have a great time with your family and take lots of photos! Jessica: OOOhh…what a great idea to use this in stuffing! We Asians are never satisfied with just bread a stuffing! *drool* Looks superb! Just a question: what does Chinese sausage taste like? I've seen it in recipes, but have yet to see it at any Asian market (although I never looked for it diligently). I've always wondered what it tastes like compared to Western sausages. Yumm.. looks really good. I think I really like the touch of ruoc/cha bong!! Xoi man was one of my favorite things to eat while living in Vietnam. Cheap, filling, delicious! connie: Chinese sausages tastes fairly sweet actually..but there's several types..some are dried first and some not and some also use chicken. Both Chinese and western sausages can be pretty greasy..but oh so good! mycookinghut: the pork floss as gastronomer puts it def is part of this dish, but the title is already long as it is so something had to go! gastronomer: you and the Astronomer sure know your xoi…we have xoi bap and xoi vo coming up! when my mom would make this for me as a child, i would eat bowl after bowl. sooooo good! your version looks so wonderfully similar to hers!! Giao: We Love Xoi man growing up as well. We always try to be authentic as possible! Your blog is so wonderful, especially all the pics are so realistic …Chị really enjoy reading it …Keep up the good works . Co Hai: Cam on chi! We're so glad you commented on our site so we can visit yours. Hope you visit and comment often! you guys are killing me with these posts. i love love this dish! with your beautiful photos i think you've finally convinced me to hit the store and make some for myself. rick: xoi would have been great for camping in Yosemite too, but you guys had a feast as it is! I will always eat this at least 2x a day when I go Ho Chi Minh City for holiday.. BEST!!! Just found your blog, and this post brings so many emotions to me. When I was still living in Vietnam, I had English lessons right after school; and a chauffer would drive me to the language school. One day, it was raining really hard, and the driver just out of the blue gave me a parcel of xôi mặn (this stuff is usually wrapped in banana leaves or lined old newspaper). He said that before he left, my dad had given him the food because he was afraid that I would be hungry because of the cold. Sorry for the wordy comment, but the memory just came rushing back to me; and now I'm thinking of my dad who lives away from me and it's making me tear up! I wish to make this yummy recipe! 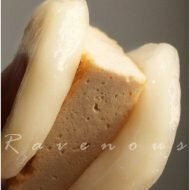 However, would you please tell me what Rouc/cha bong is and where to find it? Thanks! Love your blog. @susan: it's the dried, shredded pork that's on top of the rice in the photos, also called pork floss. you may find it in most Asian groceries. it's totally optional and if you find it, great, if not, no worries. let us know how it goes! The recipe is pretty interesting. I have never tried making this one. I think I really should try making it. I saw this post and made this dish a while ago. I have to say its pretty tasty and everyone in the family liked it. Now my sister keep asking me to make more, hahaha. so glad your family enjoys it! tell her to visit our site! could I have one pack please ^_^ hihi ? I’m loving your blog!!! I’m having a dinner party tomorrow and was just searching for ideas and landed on yout blog… What can i say, I’m now bursting with excitement! I can’t wait for the market to open up so I can buy all my ingredients and start cooking up a storm!!! Keep up the awesome work. Love it! My girlfriend told me to check out your recipe for this Xoi. One of my favorite every time I go to the store. Now I can make it at home! Thanks! How many does thus serve? We are having a party this weekend. About 15 adults. This would be an appetizer dish, so I’m thinking triple the recipe? like all rice, it expands a bit when cooking so 2.5 cups can prb easily feed 6-8, if there’s other foods involved, we would just double it. Thank you for sharing this recipe! My mom makes a very similar version, but I always wanted to incorporate chicken and ruoc into my dish. Hi, I am planning to make xoi soon… but many of your recipe mention the bamboo steamer. I have a steamer but it’s not bamboo.. it’s made of some kind of metal.. Something like this: http://t3.gstatic.com/images?q=tbn:ANd9GcSvXfuKfbIk3OIojluXe4-elqMiU_ddTY7i49Y03uL7mUgpc-Lm So, is there a special way to cook with that? Should I still line it with muslin cloth? Thanks!! Love your website! So glad I found your recipes! We had a great trip to Vietnam and have been trying to recreate some of the GREAT food we had. Love the caramel fish, going to try to chicken! We have enjoyed sticky rice for a long time, but I had only steamed it plain, soo many great choices now! Thanks again! 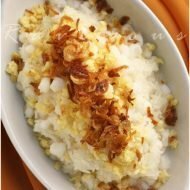 I tried this recipe and the rice comes out dark, not white like in your picture? Is it the particular soy sauce I’m using? Or am I not steaming it long enough? Any ideas?